Preheat your cast iron skillet over medium high heat. Combine all the Orange Broccoli Beef Sauce ingredients in a small bowl or mason jar and whisk to combine. Set aside. Pat the flat iron steak completely dry with a paper towel, then season with the salt and pepper. When the cast iron skillet is warm, add in the avocado oil. Sear off the steaks until golden brown and they have an internal temperature of 125ºF, about 5 or so minutes per side depending on the thickness of your flat iron steak. Remove the steaks, and allow to rest on a cutting board. 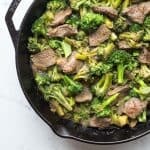 In the same cast iron skillet, add the broccoli, onions and water. Cook over medium high heat until the broccoli and onion are tender and all the water has evaporated, about 5-8 minutes. Thinly slice the rested steak against the grain, then add back in to the skillet with the cooked broccoli and onions. Add in Orange Broccoli Beef Sauce, and cook for 1 to 2 minutes until warm and the sauce has thickened. Serve warm. Great with cauliflower rice and topped with sesame seeds! Meal Prep Instructions: Store in an airtight container for up to 5 days in the refrigerator. HEATING: Either microwave until warm, about 3-5 minutes (I like to sprinkle in a little water to help it steam and prevent it from drying out). Or reheat in a 350ºF oven until warm, 10-15 minutes. Other Veggies: Sometimes I like to add in sliced red bell pepper! You can substitute cauliflower florets too. Whatever vegetables sound good to you!